If only the number of times had been counted when others have said “I wish I’d done…” this or that back when there was more time to do things. Good intentions only get one so far, then comes the tough stuff – actually doing what the person said they would. You or I might be able to pull the wool over each others lives for a little while, but when things begin to become secular in nature – it will be noticed. The more we as Christians stay involved, seeking Him constantly and working on not repeating our past failures, the more our Heart will show forth concern, spreading the Gospel and genuine care for others, and their concerns. Somehow the world has conned the Christian into thinking that our Lord and Saviour has NO idea what we struggle with from Day to Day, thus we should struggle to find answers to our daily difficulties anywhere but where we should focus. Not knowing where our heart is placed can lead to very difficult days and does not show forth the reflection of our Saviour to anyone, much less God the Father Himself. The Word of God is an instrument that our Heavenly Father has provided for us, which gives us both a barometer and thermometer on our doings and goings – but we have to be the ones that have the willingness to seek the guidance and reproving which it provides. The only requirement needed to understand it is the Holy Spirit, which either stands on the outside wanting in, or is on the inside waiting to be heard – so that change can be made utterly. It is our “heart” that God the Father wants, which has to be cleaned to serve Him. Our showing forth the degree of hold that the Word of God has on us, is done in SO many ways, including: Having Peace, Having Direction, Growing in the Lord, Seeing His Work in Our Lives, Faith, Joy, Love… Having, reading and obeying God’s Word changes us on the inside such that anyone around us will easily be able to see the difference, even if they have NO idea what it took for each of us to get to that point. While this list is far from exhaustive, it does provide fifteen (15) ways to show others as well as yourself what the Word of God can do with, in and through our hearts! Is your and my heart in it? Are you and I fully committed? 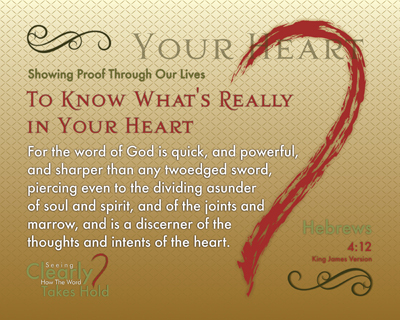 What pieces of God’s Word do you and I know? Do we have a specified time, place and plan to meet with the Lord each day? What part of our lives has the VERY Word of God taken hold? In each area of our lives where Jesus reigns King, it will be because we Honor, Praise and Worship Him – with instruction/conviction given us by the application of God’s Word in our lives! The time personally spent with the Lord, pouring over His Word and seeking His Wisdom is some of the best times of my LIFE! It is humbling to know that others can see it such that it shows in the very things of my life. Not only can (should) we read the Word of God, but we might (would) be surprised how much of the intake leaks out onto/into the things we do everyday. 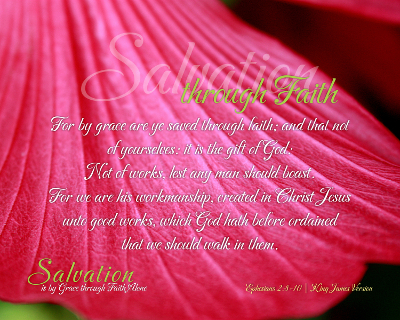 At times the lines are blurred as to just how we see or even consider how Salvation has been given to us – for it has indeed been GIVEN, for it COST our Saviour His LIFE as the ultimate Sacrifice! Can we indeed as individuals “SEE” this Salvation in others? Do we “KNOW” how that is shown to be True to others through our lives? It is not of or in ourselves, but it is by the reflection that is made REAL in our lives. Have we stopped for others to smell the the Rose which have been bestowed in us, for He LIVES? It is understood that each of us, Saved or unsaved, is a sinner, but Salvation grants the Believer to be Saved by Grace, through Faith – ALONE. There should be a reflection, ever so slight even on the first day, of the change in an individual that has placed their Faith and Trust in the Lord Jesus Christ as their Saviour. 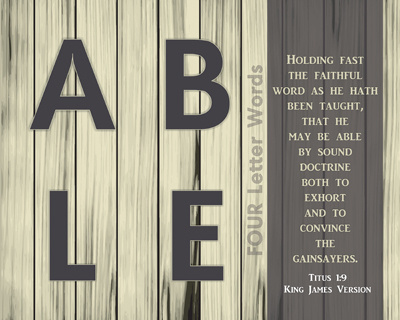 What is being described here is purely Salvation – nothing more, nothing less – by Grace, through Faith – ALONE. This Series beginning (for which it is written about) is made from an open heart of a man who truly knew that a part of his audience in which would read his article would find some small, insignificant matter in which to use against him. The process of “mattering” has most likely been repeated in one form or another since the beginning of mankind – for Lucifer used it in the Garden of Eden. It can be thought of in this manner, gifts that come with strings attached – I know personally of a few folks that seem to only give them (gifts) when they feel they can have some form of control (of the receiver). 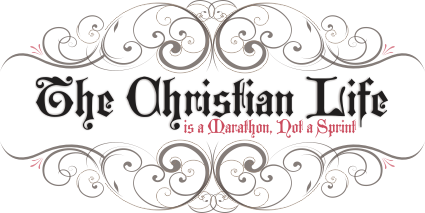 Have I done Justice to Them as a Brother in Christ? Did I Lead Them in the Right Manner on Matters Biblically? Was My Time Spent Wisely on Their Account? Were My Responses Focused Correctly upon God’s Word, not my Own? Has My Investment of Time been God Oriented? We can ask all the questions under the sun, still coming away with some doubt in our positive nurture of others – but there is one thing we cannot offer, nor can we deny – Salvation is NOT of our doing. We can share our Testimony – but that is not Salvation, it tells our story on our account, which is most positively the best way to be an effective witness. We are SO accustom to doing something, that accepting God’s Gift of Salvation, which was paid for by Jesus Christ, seems foreign. When we consider why it seems foreign, we have MUCH to learn. One of the reasons it sounds so odd and unrealistic is because we may not be spending time in God’s Word to discover just how “simple” and “true” He has indeed made it. This Series is built upon ten (10) passages that can help us realize that it is of God’s Doing and not of our own. As Christians it would do us well to learn these and further read His Word to “see” all the things He does cover in His Word. It’d surprise a great many folks, upon a little study, what His Word actually covers – a challenge would be to find something it doesn’t address, rather than what we think He missed. There are ten (10) phrases presented, along with corresponding passages of Scripture tied to prints which give a visual appeal to having the Word of God presented in front of us. May we as Christians realize the opportunity we have to witness others and know more than just the ABCs or Roman’s Road when sharing the Gospel with others – the Word has much to say about Salvation. Salvation is not a “gift” that a Christian can give to another individual, each person has to accept that on their own accord and believing… It is an entirely different thing to consider whether or not another individual can “see” Salvation in a Christian – because they VERY well can how the “Gift” has changed us. As Christians we have much influence on the Saved and non-Saved alike, for the better or the worse. How we represent our God and Saviour can have a “life or death” realization in another persons life. What we show others, because of what we believe ourselves, will provide some type of influence – be it good or bad – upon that persons life. Do you as a Christian “Believe” each of the passages of Scripture used in this Series? Do these passages ring true in our lives? The better we can show from God’s Word what He Says about Salvation, the more likely we are to share His Word with others so they might have Salvation. We cannot add anything to it, but we can show how it has changed EVERYTHING in each of us because of it! 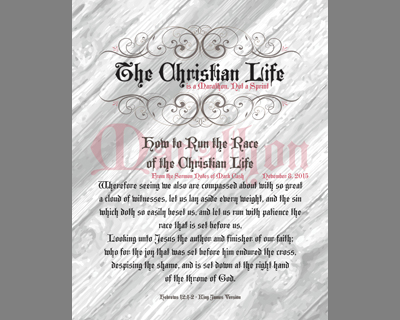 The Christian Life can aptly be compared to the running of a distance race. To succeed, much is considered in leading up to the successful completion, a person isn’t instantly able to make a go of it without facing a mountain of difficulties. Arguably the most widely recognized race is the marathon, which is roughly twenty-six and two tenths of a mile (26.2 miles). In order to successfully complete/finish. The beginning of any marathon requires that a decision be made, which is to accept the challenge – it is a weighty decision. To be successful in the completion, preparation must be made with an end date in mind – with as much gaining of knowledge and practice as possible. Just as a successful running of a marathon takes time, so does it become in our lives. The Decision to run the race – is Salvation. Any preparation and working in the direction without Faith in Christ. Any preparation and working in that direction without Faith in Christ is without benefit or Blessing. Once we have accepted Jesus, the Son of God, we then have the correct solid foundation in which to begin trading to run the rest of our lives. One of the things for me is music, to whistle, play or listen. We as human beings are built to respond to sound, music, rhythm – even God Himself sings over us – that is from God’s Word – not mine. Another very important factor of being a paced constant runner is to keep a constant check on weights. Each of us can have a propensity to hang onto things like baggage, hurts, judgements, habits, attachments, associations and such that keep us from running as we should. We each need to take time to re-focus every single day, seeking His Direction, His Focus and His Position in our lives. These nine (9) passages of Scripture, both individually and collectively, help point us to how we can have the most successful Christian Life. This Series has been such a good reminder to the Christian as to what really will help us run our Marathon race of the Christian Life more effectively. First of the firsts though, is the decision of Salvation. A person can choose to be the “best” person they can be, but if they do without having the most Important Eternal decision made, the race can be run, with all the expected “appearances”, having no end. We must keep in mind that our race is uniquely ours and our Heavenly Father’s – not to be compared to anyone else’s for the purpose of success or any other reason. Are you or I struggling along our race, doing well sometimes and experiencing head on struggles at others? May we look at this reminder list, considering how we are doing, asking our God to help us Please Him. Who is God the Father to YOU? A seemingly pointed question that every Christian should ask themselves every now and then; when is the last time you asked yourself that question? Would you or I be able to list twenty-one (21) things the LORD is to us, sort of like the thought behind Twenty One Questions, reminiscent of the childhood guessing game. Instead of course a person asking twenty-one fact finding questions about a single item, would we be able to give Praise and Honor to our Heavenly Father? Reason, Praise and Honor is a part of those additional items presented in this Series. 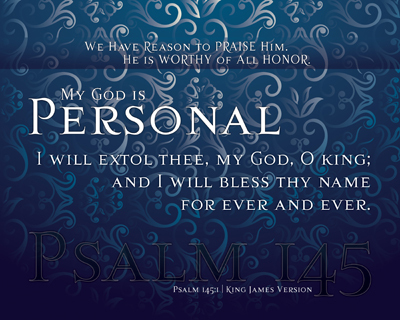 An entire chapter of Scripture, Psalm 145 | KJV, is one of those passages where we are given just that – an opportunity to Praise and Honor Him for being our LORD and God. These are just a “peak” into vast and different ways He is Good toward us. Each of the prints present a single verse of Scripture, with the exception of eleven (11), which has two (2) verses because of an incomplete sentence and/or thought. The prints fit into one of two categories, the first being “personal identification” and the second being “unmerited favor recognition”. There are more than twice more “personal identification”  than there are “unmerited favor recognition”  prints which follow the mindset of Him being a Personal God to each of His Children. It helps to understand that what our Creator God wants above all else is to have a PERSONAL relationship with EACH and EVERY one of us! As we learn more about Him, His Son Jesus and the integral part of the Holy Spirit’s work in our lives, we will more clearly see how we can identify the Reasons as they occur to Praise Him. God’s Word, His Written, Breathed Word, the Bible, contains the Love Letter of all generations which covers everyone. An incredible twenty (20) items pulled from twenty-one (21) verses of Scripture from an entire chapter of Psalms is presented so we can more fully understand how Incredible our Creator God really is to each of us. Is there a single something that makes you want to stop whatever is being done at a moments notice to just PRAISE the Lord? What is it that others see in you or I that gives them a clear indication Who is the One that is the object of your or my affection? As we consider how our lives count for the Cause of Christ, this Series gives us twenty (20) examples from just one chapter in Psalms. May we realize that all that we do has an impact on those around us, whether it be for the positive good or having a negative shadow cast that we’d surely never intend on purpose. On purpose we can indeed share with others the Reason to Praise Him! Who is looking for you and I to do so? The beginning of this Series occurred from a most unlikely source, or maybe not, because we are so bombarded by the reason for it. The name of the Series was chosen specifically to poke into something that we as Christians have been flirting with for well longer than we should have been – accepting the status quo on language used in our homes, offices, cars, schools and EVEN our churches! We have become TOO relaxed with what we will allow to be “acceptable” in our presence. 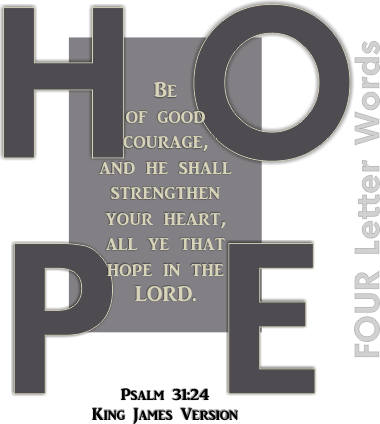 Have we ever thought to have a full arsenal of “FOUR” letter words from God’s Word to remind us of Him instead of having those “others” rotting away at our minds, testimony and witness? 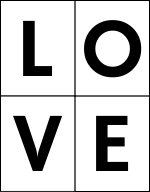 It was AMAZING to find SO many of them – in just five (5) minutes a quick list of 127 was scribbled down for twenty-five (25) of the twenty-six (26) letters of the alphabet, with only one not having a word associated, that being the letter “X”. Do you know what a gainsayer is? A person who contradicts, disputes or denies, being in opposition to what is being shown to be inappropriate or wrong. From the VERY first word, this Series started off with a full on “help” for Christians to be armed with a “FOUR” letter word from God’s Word to combat those that would use language that is not only offensive to man, but even more so offensive to our Heavenly Father. Whether you or I are bombarded with inappropriate language, or have them in use ourselves, we need these words as a study vocabulary to confront our even being exposed to them. The more of them we know, the more of God’s Word also will be known. They are presented as a representative of Godly Character, pleasing and just in God the Creator’s Eyes, Ears and Mind – all the more we should strive to know them. The only letter that has been “left out” is the letter “X”, which I believe we can apply to something very important – the crossing out whatever word that is offensive, no matter how many letters it may have. Each of us need these, for NO ONE is immune to the challenge of filthy or derogatory language, but we can DO something about it. We can have an answer to it, an appropriate response to it and have a testimony that is pleasing to our God and Saviour while we are at it. Be honest with yourself before a thrice Holy God – is this a problem for you? For the first time in my life a few months back, my family and I were floored to hear language spew from the mouth of a “Christian” inside of a Church House, that would be expected to be heard in a Rated R movie. We each were mortified – just imagine, not even the meeting place of God’s Children is considered sacred in a word. It is realized that we are the “Temple” of the Holy Spirit, so by the higher token, imagine how our Creator feels when we defile His Temple when we use, hear and subject ourselves to such language. Will we choose not to defile ourselves, such that we might be the witness we ought to be?